"Music is my savior, and I was maimed by rock and roll/I was tamed by rock and roll/I got my name from rock and roll." My discovery of Wilco occurred in early 1995 during my freshman year of college in Columbia, Missouri. I attended their concert at the Blue Note club having only heard a few songs by Uncle Tupelo, which contained many of the same members. Touring prior to the release of their debut record, A.M., Wilco performed some new tunes and mixed in many of the classic Uncle Tupelo songs. The packed club was filled with energetic fans singing along to every word of the country-rock tracks. A remarkable atmosphere pervaded the venue, and the band did not disappoint. Over the past eight years, Wilco has returned numerous times to Columbia and St. Louis and provided more enjoyable concerts. With each subsequent release, their music has moved beyond the rootsy sound and expanded into more complex avenues. Singer/guitarist Jeff Tweedy has continued to improve his songwriting, and while the lineup has changed considerably, the musicianship is still very strong. The 2002 release of Yankee Hotel Foxtrot represented a new step in their creative process. Critics hailed it as one of the best records of the year, and fans openly welcomed the unique sounds. I Am Trying to Break Your Heart chronicles the topsy-turvy creation of Wilco's latest record and showcases some of their best music. Beginning with the initial recordings at their loft, the compelling documentary follows the band through each step of the album's development. Originally intending to simply chronicle the process, director Sam Jones' small picture became much more when Reprise Records turned down Yankee Hotel Foxtrot and dropped the group. In addition, longtime member Jay Bennett left the band during filming. While the initial conception would have interested devout Wilco fans, the unfortunate problems led to a much more spellbinding drama. Following the early recording sessions, Jeff Tweedy takes a break and embarks on a brief solo acoustic tour. His lyrics work especially well in the quiet acoustic setting, where the emotions and stories are easily accessible. Although very quiet and mild-mannered, Tweedy is a magnetic performer and has little trouble holding the audience's attention. Some odd statements by the backstage minglers in San Francisco obviously make him uncomfortable and quickly end the conversation. This interlude may not further the main story directly, but it does reveal a bit more about Tweedy's persona. His silly conversations with comedian Fericito also showcase a light, sarcastic tone that intermittently appears during the film. While capturing the positive aspects of recording, Jones also unflinchingly presents the quickly dwindling relationship between Bennett and his fellow band members. Easily the toughest moment to watch is the escalating argument between Tweedy and Bennett over production issues. Although neither raises his voice too much, the increasing tension is easily recognizable. The end result is Tweedy throwing up in the bathroom from a serious migraine headache. While neither is totally at fault here, this inability to communicate over a single point reveals a larger rift between the duo. Once Bennett has exited, the guys try not to be too harsh, but their obvious happiness is difficult to hide. A touching, emotional version of "My Darling" from Bennett does give him a proper send-off and remove a bit of the sting from the previous interviews. If Jones does falter in any area, he gives too much screen time to Wilco's arrogant manager Tony Margherita and Rolling Stone writer David Fricke. The business side of the dealings with Reprise is an interesting and necessary element, but a bit too much emphasis is focused on Margherita. His words about Wilco sticking it to Warner seem a bit hollow when compared to his earlier comments of this album being pivotal for their stardom. Additionally, Margherita's callous statements about Bennett are unnecessary and overly harsh. Fricke's comments about the importance of art would be less annoying if he didn't write for a giant corporate magazine that cares little for real music. His appearance might verify Wilco's importance to some, but it also shows Jones trying a bit too hard to nail down the point. 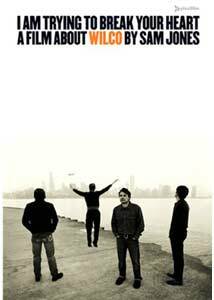 Even given its shortcomings, I Am Trying to Break Your Heart succeeds wonderfully because it showcases Wilco at its best�in the live setting. By devoting lengthy screen time to rocking versions of Monday and I'm Always in Love, a sweet pop number like Heavy Metal Drummer, and the haunting acoustic Sunken Treasure, Jones verifies Wilco's excellence. The impressive black-and-white photography also allows the film to work both visually and sonically. Driving with Tweedy through Chicago over the music to I Am Trying to Break Your Heart, the city itself becomes a character and helps to provide a remarkable experience. Image Transfer Review: Sam Jones's elegant black-and-white photography works extremely well and receives a worthwhile DVD translation. The 1.85:1 anamorphic widescreen transfer does feature a decent amount of grain at times, but it never distracts too much from the overall presenation. Some technological limitations of the low-budget documentary probably came into play here, which is definitely understandable. Audio Transfer Review: I Am Trying to Break Your Heart would suffer considerably from a lackluster transfer. Luckily, the 2.0-channel Dolby Surround transfer effectively presents Wilco's music without a hitch. I was slightly disappointed by the lack of a 5.1-channel Dolby Digital track, which could have enhanced the songs' complexity significantly. However, the limitations of the original soundtrack probably played a role here. Extras Review: I Am Trying to Break Your Heart features an impressive collection of extras that should please Wilco fans and new converts. Especially interesting is a feature-length commentary from director Sam Jones and the four members of Wilco. Jones offers plenty of background about shooting, while the band gives quick tidbits about creating the record. During Tweedy's worst argument with Bennett, they leave the room and ask Jones to fast-forward the film. Throughout the feature, the guys do inject plenty of worthwhile material and seem very down-to-earth. Also interesting are Tweedy's comments about the awkward backstage moments, which embarass him considerably. The second disc contains a wealth of additional footage that mixes silly throwaway moments with interesting performances. The music highlights include Tweedy's excellent solo performances of the Tupelo classics Wait Up and Acuff Rose along with such full-band numbers as the recent Pot Kettle Black and Being There's Why Would You Wanna Live. The 24 scenes also provide more silly material from Fericito and some silly mugging for the cameras from the group. A separate section has full versions of the film's two solo tunes�Not For the Season and Sunken Treasure. The remaining supplements include a short featurette, the theatrical trailer, and an extensive booklet. I Am Trying to Make a Film runs for about seven minutes and provides interviews with Jones and Tony Margherita. While pretty brief, it does feature some interesting comments about the cameras possibly disrupting reality. The 40-page insert includes a filmmaker's diary, photos, and liner notes from David Fricke. I Am Trying to Break Your Heart offers an intimate portrayal of a compelling band, but it does run into some difficulties while praising Wilco. Some critics have criticized Jones for treating Jay Bennett unfairly and placing Jeff Tweedy on a giant pedestal, and their statements are not completely unfounded. In addition, the difficulties with Reprise also received a backlash from viewers put off by manager Tony Margherita's arrogant attitude during interviews. Even given these issues, this documentary remains an excellent look into the music and struggles of a rising band. Wilco may not be huge stars today, but their songs should be relevant long after many pop stars have been forgotten.